Low-Carb No Egg Breakfast Bake with Sausage and Peppers is a delicious low-carb or Keto breakfast without eggs, and if you use gluten-free sausage this recipe is also gluten-free. Use the Diet-Type Index to find more recipes like this one. 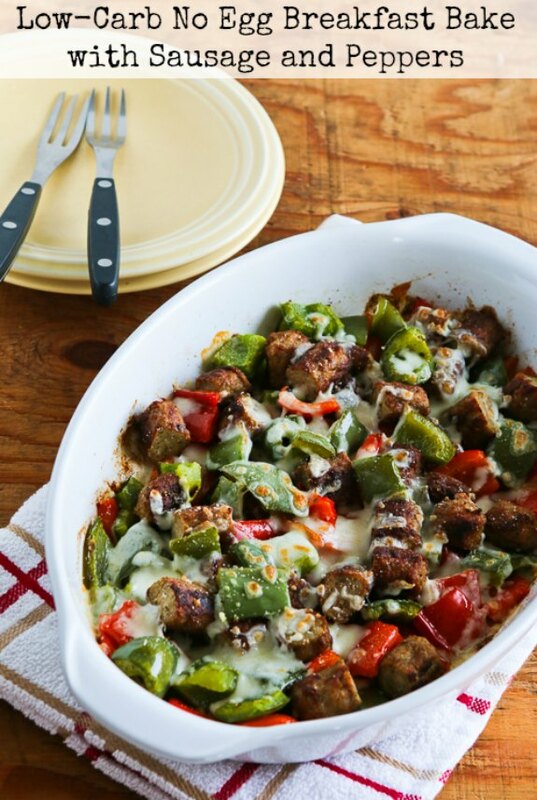 Click here to PIN Low-Carb No Egg Breakfast Bake with Sausage and Peppers! This Low Carb No Egg Breakfast Bake with Sausage and Peppers is a delicious idea for a breakfast without eggs, just for everyone who’s getting tired of them! I’m pretty excited about this new recipe because for eight years now people have been asking for a low-carb or South Beach Diet Phase One Breakfast without eggs. I’ve thought about it many times, but never came up with anything until a few days ago when the idea for this Low Carb No Egg Breakfast Bake popped into my mind. 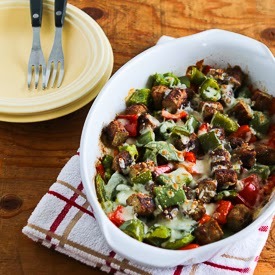 In my experiments I made this Low-Carb No Egg Breakfast Bake with Sausage and Peppers two different ways. The first time I roasted the breakfast sausage and peppers together at 400F for about 40 minutes and then topped it with a little cheese and put it under the broiler. The second time I roasted the peppers alone at 450F for 20 minutes while I browned the sausage in a pan. Then I cut up the sausage, combined the sausage and peppers and cooked them for 5 more minutes in the oven, added the cheese and broiled. Both versions were good, and I’ll give you both options in the recipe, but I preferred the second version where the sausage is browned separately. This definitely reheats well, so feel free to double it and use a larger baking dish to make it forWeekend Food Prep. I put the leftovers into serving-size containers and it reheated well in the microwave. Low-Carb No Egg Breakfast Bake with Sausage and Peppers is a delicious low-carb, Keto, low-glycemic, and South Beach Diet Phase One breakfast without eggs. Cut away the stem part and cut out seeds of the red and green bell pepper and chop peppers into pieces about an inch across. Put peppers into the baking dish, toss with 1 teaspoon olive oil, sprinkle with Spike Seasoning and fresh-ground black pepper, and put the dish in the oven and bake 20 minutes. While the peppers cook, heat the rest of the olive oil in a non-stick pan, add the sausages and cook over medium-high heat until they’re nicely browned on all sides, about 10-12 minutes. Remove to cutting board, line them up, and cut sausages into thirds. When the peppers have cooked for 20 minutes, stir in the sausages and bake 5 minutes more. Remove from oven, turn oven to BROIL, sprinkle the grated Mozzarella over the sausage-pepper combination and put back in oven and broil 1-2 minutes, or until the cheese is nicely melted and starting to brown. Cut away the stem part and cut out seeds of the red and green bell pepper and chop peppers into pieces about an inch across. Line up sausage on a cutting board and cut them into thirds. Put peppers into the baking dish, toss with 1 teaspoon olive oil, sprinkle with Spike Seasoning and fresh-ground black pepper, then add the sausages and stir to combine. Put the dish in the oven and bake 20 minutes, stir and cook for 20 minutes more. This keeps well in the fridge, so don’t be afraid to double the recipe if you have a larger baking dish. I package mine in individual refrigerator dishes and heated about 2 minutes in the microwave the next morning. When you use lean turkey breakfast sausage and low-fat cheese, this Low-Carb No-Egg Breakfast Bake would be great for all phases of the South Beach Diet. With higher-fat sausage and cheese it would be perfect for traditional low-carb eating plans, including Keto. What are the nutritional facts that accompany this recipe? I guess you won’t see this because this article’s a year old now, but thank you for posting a savoury breakfast recipe that doesn’t contain eggs! Every comment comes to my e-mail, and I do try to reply to most of them! So glad you are enjoying it! Thank you. I am allergic to eggs and I am diabetic so finding breakfast options has become challenging. I make a similar dish as dinner and hadn’t considered adapting it to breakfast. By the way, the one I make has fresh tomatoes diced and tossed in just long long enough to warm at the end. It adds a lovely crisp tang. Again, thank you for sharing this. So glad you like it. I do like the sound of your version with some fresh tomato! Sorry, I don’t know anything about My Fitness Pal. I do see them in my stats, so I know they feature my recipes, but I don’t know if people track the nutritional information through there. I’m pretty sure spike seasoning and Jimmy Dean are not Keto. Or healthy. Is MSG seriously Keto? And I am pretty sure that a Keto eater who feels that way can substitute a different brand of sausage and use a seasoning they prefer. Why the need to lecture me about what I used? Doesn’t everyone get to make their own food choices? That has always been my personal philosophy, and “food police” comments aren’t really welcome here. Not sure why you left a comment scolding me instead of just adapting the recipe to your diet. That doesn’t really seem so difficult. You must be unaware that I started this site when I was following the South Beach Diet, which does recommend lower fat meats and cheeses. As my diet has changed to a more carb-conscious approach (and as my blog has evolved to one with recipes suitable for many types of diets), I have been editing posts to reflect the options on recipes. But there are 2,200 recipes on the site, and obviously I hadn’t gotten to this one yet. Just found this recipe and comments while browsing. Thank you for standing up to people who find it necessary to scold or criticize others because something doesn’t suit their needs or because they have to show they know better. In this case, they may be improving their physical state, but they also need to work on the mental. I’m going to check out your site and more of your recipes. Thanks Janice! I try to be nice in the comments, but some people really do get to me with their sense of entitlement! Over the past few years I keep coming back to you website for wonderful SBD ideas, or just healthy ideas in general! As a newlywed and trying to learn to cook for two, you've been a big help 🙂 Thank you! Comments like that just make me smile! Thanks for taking the time to let me know. As Innkeeper at a B&B, I recently had guests that required special breakfast to accommodate their food restrictions. One guest could not have eggs due to an allergy. The other couldn't have pork. I prepared the recipe and it was a huge hit. I also prepared Southern Grits and laid the turkey sausage & pepper mix on top of the grits. For a protein punch, I added a poached egg on top for those guests who allowed them. Thank you for making me look so good! Glad to hear people enjoyed it! Abby, glad to hear you're having success with the diet. You'd have to experiment to see how you like refried beans or other veggies in this; I can't really say without ever trying it but I think there might be some potential for variations. Hi there! I'm new to SB and its working, all thanks to your Kalyn. It's making this diet do-able! can I use refried beans or will that be difficult in the recipe? what about adding a veggie? what would be good? Emily, your version sounds great! Great idea, my version based on what I had handy was peppers baked as directed, Al Fresco Spinach and rosemary chicken sausage browned using the broil setting in my toaster oven, and then broiled all together in the oven with a topping of halved cherry tomatoes and feta cheese. I loved it and my husband did too after he got over that I wasn't making eggs too! I am not doing SBD but striving for a lower glycemic and lower sugar way of eating and it's made a big difference. Cynthia, so glad you both enjoyed it and what a great idea to make a double batch! This is a perfect recipe for someone who doesn't like eggs every day for breakfast. I just made the recipe this morning and my husband loved it too. While I had the oven hot, I went ahead and made another batch for breakfast this next week. Perfect! Thank you. Rosie, so glad you liked it. And I love hearing your additions, thanks for sharing that. Oh My!! This was incredible. I ate it this morning. I did add mushrooms, onions, and red cabbage. Made this yesterday morning, but used turkey pepperoni (didn't have the sausages), and added some onion and a couple tablespoons of leftover pasta sauce. Topped with cheese, it was like a breakfast pizza without the eggs! I'll bet it would also be good with black or pinto beans and chorizo! Thanks Ann! I appreciate the nice feedback. 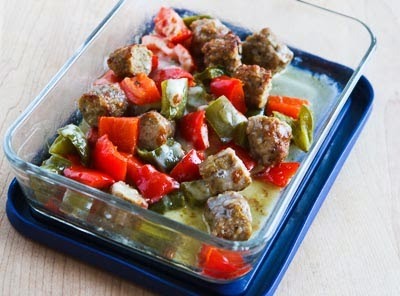 Sausage, Cheese, Peppers oh my! Yum, definitely on my shopping list for next week. This will be an anytime of day meal for me. Thanks Kalyn, you recipes are always so good! Thanks Erin. And I hope I convinced you that the brown-the-sausage method is best! Kayln, I love hearing about the two different ways you tested the recipe. Thanks for the "behind the scenes" peek. I'm not on South Beach, but I'd 100% faceplant into a big dish of this tasty-looking bake! CJ, that sounds good! I love those jarred cherry peppers. This reminds me of a dinner dish I do… chicken breast or thighs, bite size pieces of italian sausage and jarred cherry peppers and sliced pepperonicinis. I would totally eat it for breakfast! I wouldn't use frozen peppers, but you might like it that way. I like the peppers to be kind of crisp. I'd just cut the sausage into bite-sized pieces. Could I use Frozen Tricolor pepper strips? Also if I'm using brown and serve turkey sausage patties how many pieces should I cut them into? This would be awesome with Chorizo or italian sausage too! Lydia, me too because I love the security of starting out the week with breakfast handled! Although I'm an eggs-for-breakfast lover, I also love having this alternative idea. I would definitely double the amount, and make enough for a week.